Which sent us scurrying to the Herald to see if it had suffered its accustomed fate. 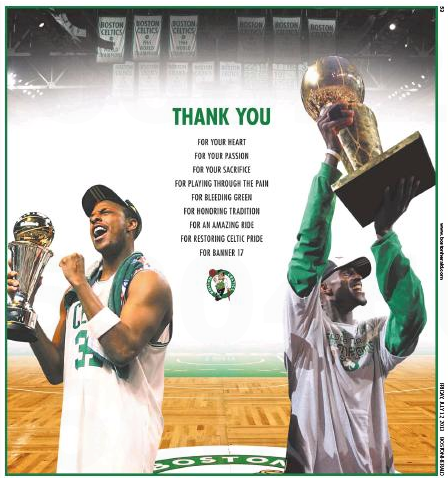 The Celtics gave the feisty local tabloid equal time (and ad space). 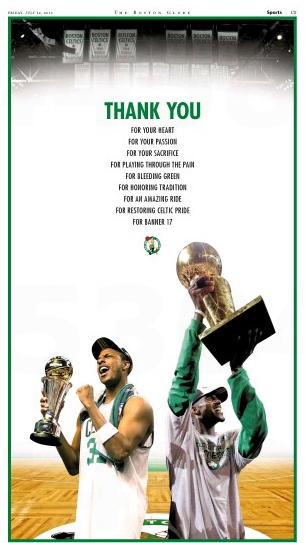 The Celtics took out a full-page ad in Friday’s Boston Globe to thank departing stars Kevin Garnett and Paul Pierce for “bleeding green” all those years. It’s a nice move that you don’t see teams pull out for just any departing players. But then, nor is it any surprise that Pierce and Garnett would merit special attention . . . Moral of the story: Someone’s always ignoring the Herald somewhere. This entry was posted on Friday, July 12th, 2013 at 5:06 pm and is filed under Uncategorized. You can follow any responses to this entry through the RSS 2.0 feed. You can leave a response, or trackback from your own site.